I have learned over the past few years that life can be messy. I think during my twenties I was so busy being pregnant and having tiny kids that diapers, babies rolling over, kissing boo boos and all that other stuff consumed my thoughts and conversations with friends. Now my kids are a little older, and I am a little older, and I have seen and experienced some tough things. Life is complicated. And sometimes life hands you Plan B. My sister has recently been handed Plan B. It has been hard to watch. I have felt helpless. I have been slowly trying to help her get situated down there. It has been hard to whittle down her belongings to fit in less than half the square footage. I wanted to do more that just the normal sister stuff so I told her I could refinish the counters for her. I let her pick out the color. I contacted Rust-Oleum and they generously offered to send a kit for me to use. Then I found out my sister was taking her kids camping for a couple of days. An idea started forming. Instead of just her counter tops, I decided to do her whole kitchen! So with basically just me (my husband did put the stools together) and only two days, I redecorated my sister’s kitchen!!! 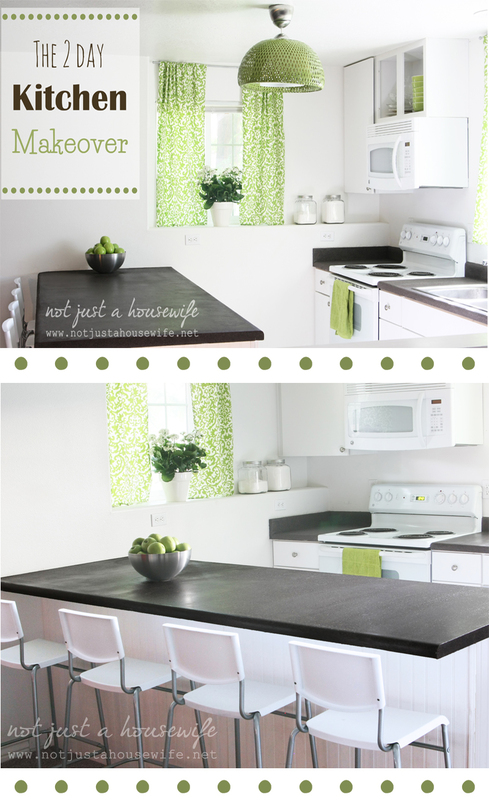 Here are the before pictures……..
Baby blue counters and mis-match décor. Dark curtains and heavy bar stools weighed it down. The curtain fabric I bought at Joann’s Fabric. It was on sale for 50% off. It was $10 per yard and I needed 3 yards. It was my biggest splurge but it really made the room. I hung the curtains as high as they would go. This helped make the room feel taller. I also sprayed the curtain rods with silver spray paint. The brown rods even though they technically matched the counters, were too dark. Aren’t you dying over how cool the light is??? I adore it. It is funky and fun. It is from IKEA and started out tan. I used Rust-Oleum’s Meadow spray paint on the basket part. The light fixture is called BOJA. The old bar stools were too chunky. Visually they were too much. It made the area seem small. So I got new bar stools that were more open and light. They started out black. I sprayed them with a spray paint meant for plastic. I will admit that I am worried about how they will hold up in the long run with 5 kids using them daily. I have used plastic spray paint in the past with success but never on something that was going to get that much wear and tear. The stools are also from IKEA and are called STIG. The bowl is from IKEA and only cost $5! It is called Blanda Blank. Previously there was a bulky, broken bench in this spot. It opened up and had storage which is why my sister kept it. Since she downgraded to a smaller kitchen, she need the storage. I replaced the bench with this BESTA cabinet. It blends into the white wall making it appear to take up less room. It also closely matches her kitchen cabinets. Plus it has more storage than the old bench! I spray painted two crates that are from Michael’s with the same spray paint as the light fixture. They will hold cereal and snacks. 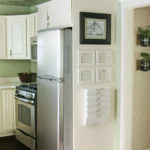 My original plan was to take her cabinet doors that were above the microwave and have the middles cut out and glass added. But the local cabinet shop was closed on Friday and Saturday so that didn’t work out. Her cabinets are not solid wood or I could have done it myself. But I didn’t want to risk ripping up the outer coating. So I opted to just take the doors off to create open shelving. If I would have had more money in my tiny budget, I would have bought more green dishes to go in there. And maybe a pretty white pitcher. Her window sill was made out of the same blue laminate as her counters. I didn’t want to rip it out and possibly cause damage, so I built a cover for it. I used a 9 inch board and some molding. It fits right on top! I think I am going to caulk it in place. So to recap, here is what was spent and donated. $and about $50 in spray paint and accessories. So the whole kitchen makeover cost less than $600! I sewed 4 curtain panels, spray painted crates, put together the cabinet and stools (with help from my hubby), spray painted the light, hung the light, built the window sill, and resurfaced the counter tops. I will have a whole post about my experience resurfacing the counters. I need to go back over when the sun is not as bright and take some better pictures of the counters first. And because we all love a side-by-side, here you go. Simply amazing!! I love everything about it! The green is so great too!!! Wow, what a difference. The new kitchen looks so amazing. I love all the pretty green accents. Awesome makeover, Stacy! What a great sister you are ! 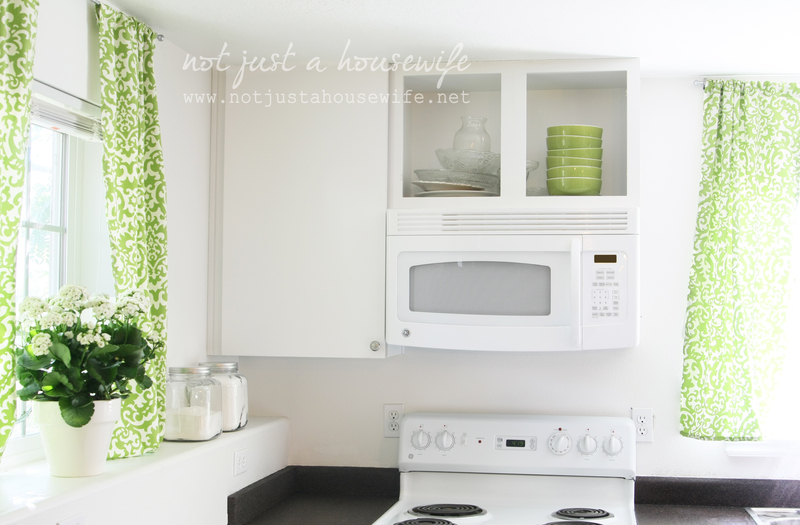 Love how light and cheerful the kitchen is now….the fabric made the makeover ! this is amazing! love the green that you choose. I am sure that you sister was just as thrilled as you were. My best to her! Wow…amazing job and gracious heart…prayers for your sister and kiddos.. Thank you :) They definitely need them. Awesome makeover! So nice the donations you got. You are a wonderful sister! Best of luck to your to sister. I hope things start to look brighter for her. Everything happens for a reason. What a wonderful makeover by a wonderful sister! Stacy you did a fabulous job and a great service for your sister!!! Thanks so much for showing a makeover that we all can do. I appreciate that you updated a kitchen like many homemakers deal with on a daily basis. 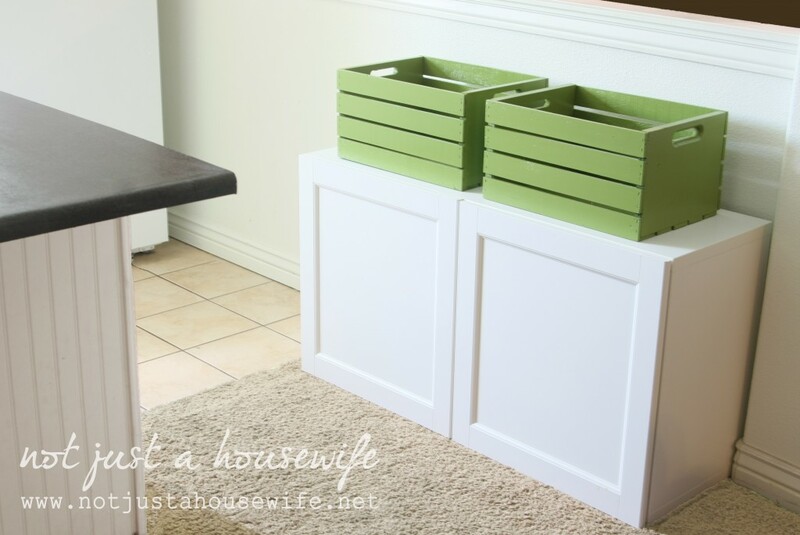 I enjoy seeing all the cadillac kitchens in Blogland but it is good to see what can be done on a modest budget!! Fabulous job!!! Will you come finish up mine? I bet your sister is ecstatic with the results! What an AWESOME sister you are :) It looks fabulous and I’m sure your sister is so happy with it! You are the best sister in the whole world! What a wonderful surprise for her, and what a beautiful space! This will surely make her situation a little brighter : ) Great job! What a sweet, kind, thoughtful thing to do! I know what it’s like to go thru rough times in less than ideal spaces and this certainly would have warmed my heart. God Bless You. beautiful job! 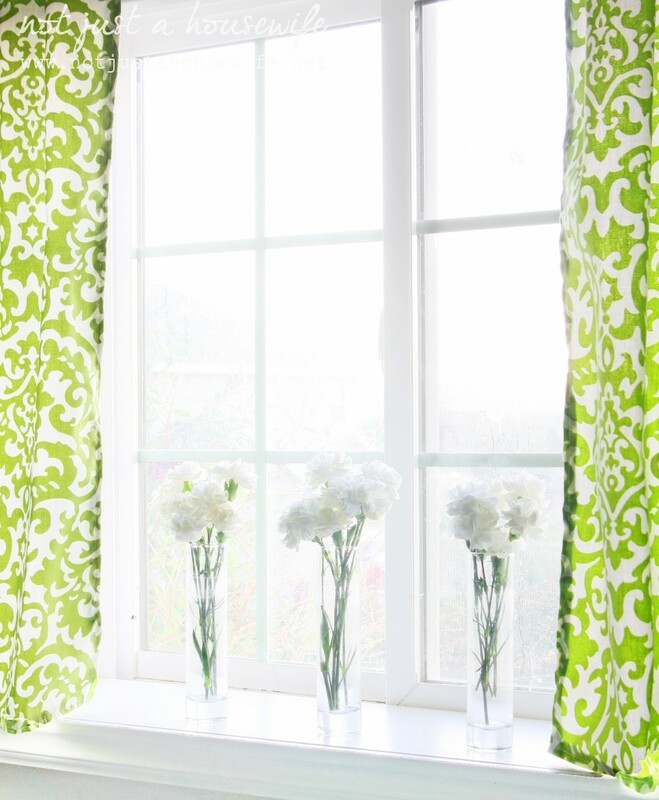 I love that fresh green with the white and black – so pretty! It’s amazing what some paint and a few accessories can do to a space. 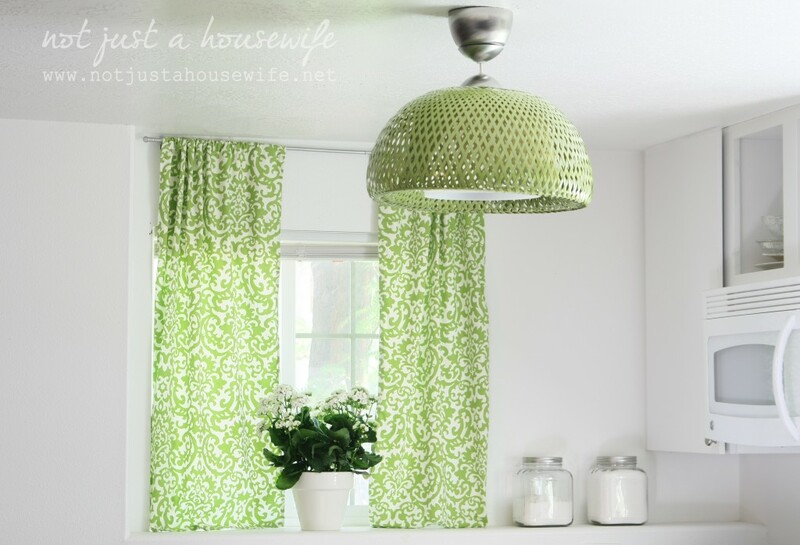 I love that light and the fabric you chose for the curtains.Oh and the green.It really makes it pop. Your sister is one lucky girl. Job well done! You’re a good sister! The kitchen re-do looks great! Was the Rustoleum product easy to use? My laminate kitchen counters are OK, but they are chipping in some places, and I can’t afford new counters! What is the texture like for the new counters and how do they look close-up? Great job … it’s amazing what a big difference little changes and fresh new accessories can make! Stacy!! It turned out so cute. I love the Greene and white. It’s so fresh and clean looking. And the light is so fun. You did an awesome job. I bet your sister is so happy!! I love this post for so many reasons! The green and white makeover is just wonderful. I love the huge difference it made in the entire room! The fact that it came together in such a short time period is incredible! I hope that Plan B works out for your sister. She is very fortunate to have someone be as supportive and loving as you and your hubby. Awesome! It looks so fresh, clean, bright and modern. Just an amazing job!! This is fantastic, and so are you! What an amazing gift to your sister!!! What a thoughtful and beautiful gesture. Your sister is very lucky to have you. I love the green! It is so bright and cheery. 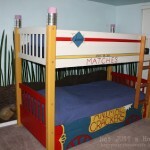 Kudos to IKEA and Rust-Oleum for their generous donations! What a wonderful thing to do for your sister!! I love the green accents. You did a great job! What an inspiration! How lovely a thing to do for your sister! You made me cry!!! So lite and airy now. How was the counter kit to use? I have read some reviews that were 50/50. Love the green! I will be writing a post all about the counters soon! Amazing! I love the new countertops. You have a standing offer to come and redo my cabinets (and countertops). I would love you to work magic on my kitchen! You are amazing! What a lucky sister your sister is to have you in her life. I’m for sure going to look into the Rust O Leum counter top kit, as my counters need a sever makeover as well. Wow oh wow! I love it. I want to spend time in that kitchen. It is beautiful! You did an awesome job. I hope your sister love it!!! What a sweet sweet thing to do and that’s absolutely amazing that those companies were willing to help you out. Wow!! What a difference. I’m amazed you did it so quickly and for so little money. What a great sister you are. I love the airiness of the room and the way you used the green accents throughout. The curtains were worth every penny–they make the room. 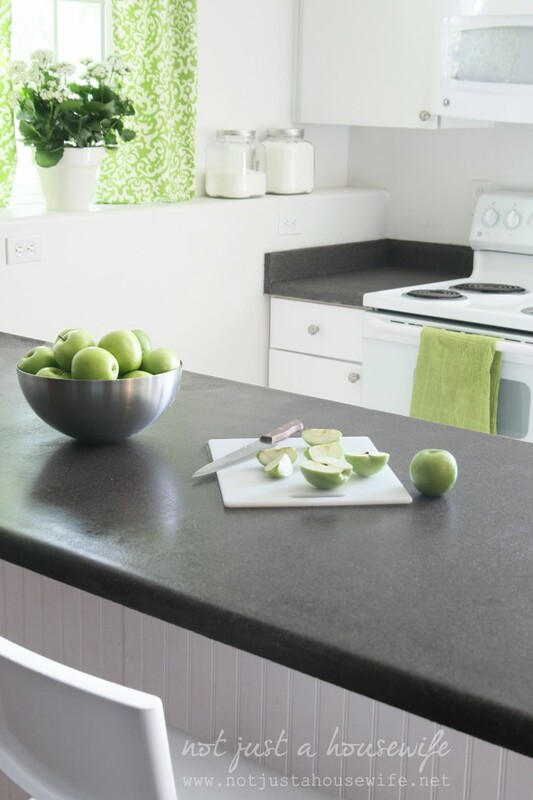 And the countertops look great. Always amazed at how you do so much with so little. It’s beautiful, Stacy! What a special gift to your sister. So pretty! You are amazing. What a great gift for your sister. WOW it is gorgeous, what a beautiful makeover, your sister is lucky to have you!!! Praying things will turn around for her. I never would have guessed that this was a basement kitchen. It’s just so gorgeous and bright and cheery! She is a lucky gal to have such a thoughtful sister :] I’m a fan of green in the kitchen too…that’s the color in ours right now! Your sister is so lucky to have you! I bet she loved her new kitchen, if looks amazing!! It looks great! So fresh and bright. You and hubby did an amazing job. Praying for your sister and her kids. Oh, this is fantastic! I can just imagine your sister’s reaction! And the best part is, every time she uses the kitchen, she will have a little reminder of how very loved she is. What a wonderful gift. Kudos to RustOleum and Ikea for their donations to the project and kudos to you for your vision and hard work. It’s Fabulous! Beautiful, beautiful. You did an amazing job! You are an amazing example and an amazing sister for doing this! Your sister and her family are in my prayers. And congrats to your husband on the new job! That is a beyond amazing transformation…especially under such a small budget and time constraint! It turned out so beautiful!!! I can’t believe how much it opened up the room just taking off the doors on the cabinet above the microwave. I LOVE the fabric you chose for the curtains. And I would’ve never thought about spray painting that light fixture! I’ve seen that light many times walking through IKEA, and would’ve never thought of that! I have to say, I love her spirit of sacrifice to be willing to do that. I used to live in Portland, working in the high tech field. During the dot bomb crash of the early 2000’s, I lost my job and had a hard time finding a replacement. As a single mother at the time, it was a pretty scary time. I decided to temporarily move back to S. Cali to stay with my mom, and rented out my small 2 bd house in Portland. I actually started dating my HS sweetheart again, and got married shortly after, and still to this day have the house in Portland as one of my rental properties as a good source of income for my family. Oh my! This is really amazing. I can’t believe how beautiful this kitchen looks with those improvements! Well done! amazing job Stacy!!! it looks so much bigger, brighter, and better! Wow, so pretty! I’m sure this will be a gift that your sister never forgets! I’d love to see a picture of her and her kids enjoying that beautiful space! Totally amazing! This does not look like a basement. Wondering if your sister thought she came to the wrong house! 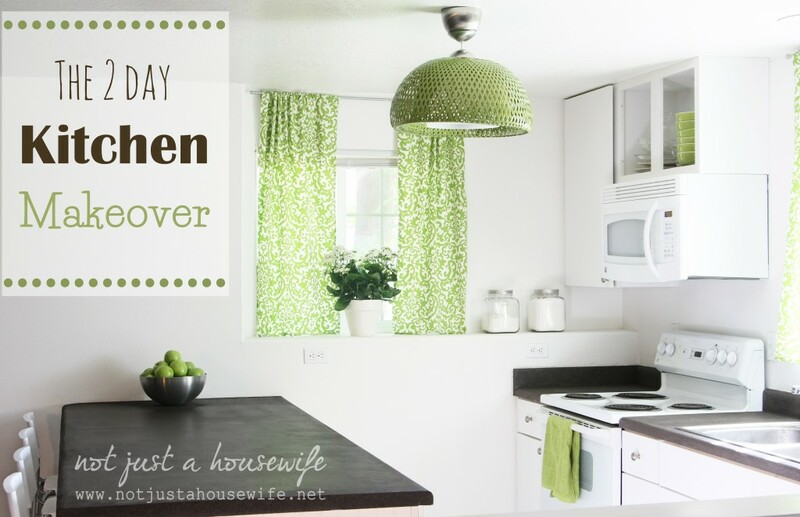 This is a beautiful kitchen make over, and a wonderful thing to do for your sister. She is so lucky to have you as a sister. I’m sure it brightened not only her kitchen but her current circumstances’ effect on their lives. I wouldn’t be surprised if you inspired her to get creative and make something great out of nothing/”junk”. Good work Stacie, as always. That kitchen makeover is awesome. I know your Sis is loving it. Your talent amazes me!! AMAZING! Looks beautiful! You are such a sweet sister! You did good Stacy. Real good. I think the light is my favorite part; it really helps to update the kitchen. How much light does it put out? Like, how many bulbs does it hold? I couldn’t tell from the website. 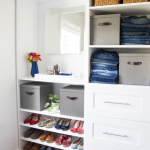 You are ahhhmazing….What you can do with small spaces and limited $$. It really looks like a totally new/different kitchen. I bet she was overjpyed! Wow, what a makeover! And, what a sister you are! Kudos to you! You’re the best little sister! I don’t even have a sister, but I have some pretty terrific sister-in- laws, who obviously taught their daughters well. You’re a sweet heart! Love you all! What an awesome sister you are!!!! it’s beautiful! This post brought tears to my eyes and warmed my heart. 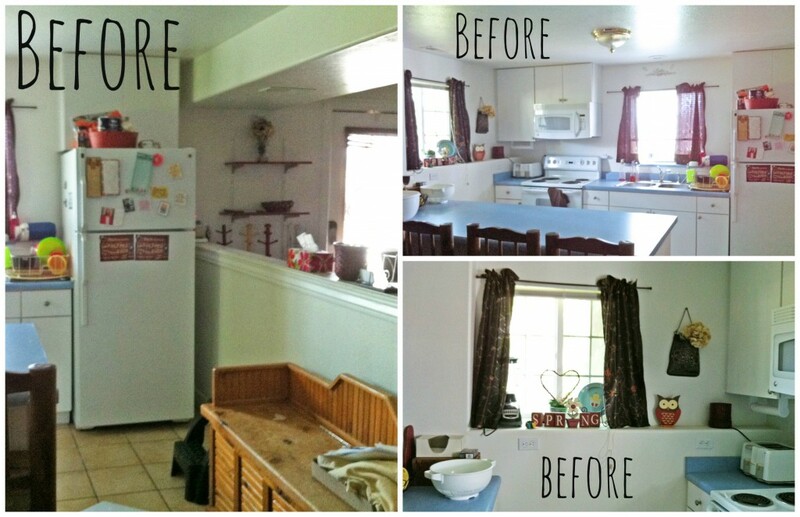 I love the transformation of Tisha’s kitchen. Looks great! I love that green! I’m sure you sister was close to tears when she saw her new kitchen! Way to go, Stacey!!!! That’s so awesome of you! You’re an amazing person! I’m sure this was just the icing on the cake for your sister, I’m sure your support means the world to her! Stacy, this is amazing! Great job on each piece of the project. Love the green and white together! Wow…great makeover!! 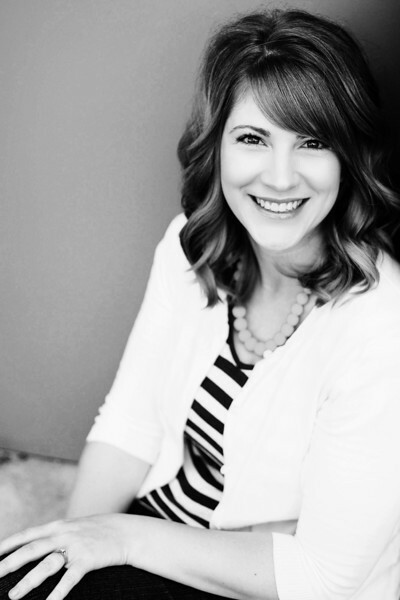 You are an amazing sister:) I am going to start following your blog right now!! What is in the glass canisters by the windows?? They would look amazing with custom vinyl labels on them. Shoot me an email if you want me to make some for you. I’d love to help in some way. I totally feel for your sister. While I have never had five kids, I have had to re-start my life. 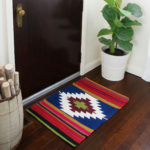 I know how hard it can be and what a huge difference a simple make-over project in your home can do. My mom re-did my entire main floor and bedroom after my divorce. It made being there alone with my son much more doable. Please let me know if I can help somehow! That is so sweet! It is absolutely gorgeous. Beautiful. It is so much better. Great job. Wow! 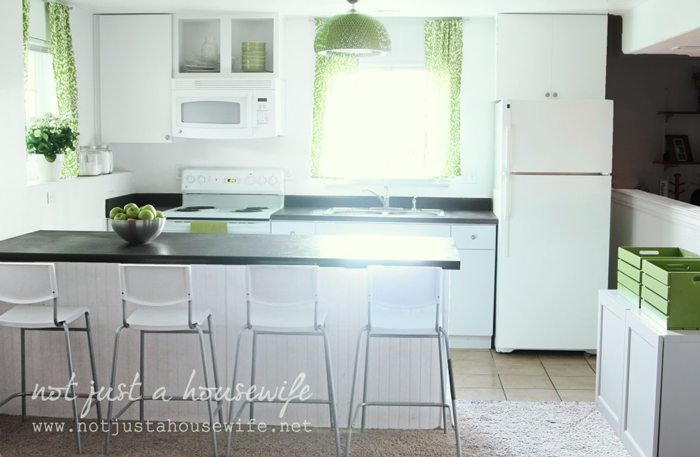 The curtains hung high and the new counters, stools and open shelves totally made it! I can’t even believe how much of a difference those changes made. Wow. Great job, and what a talent you have! Very nice! 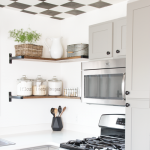 Great job,Stacy….. applauds for this smart and gorgeous kitchen make-over!It looks like a vintage kitchen. I feel inspired by this. Aren’t you a wonderful sister! It looks fresh and new. She, I’m sure, loves it and your generosity. Amazing! 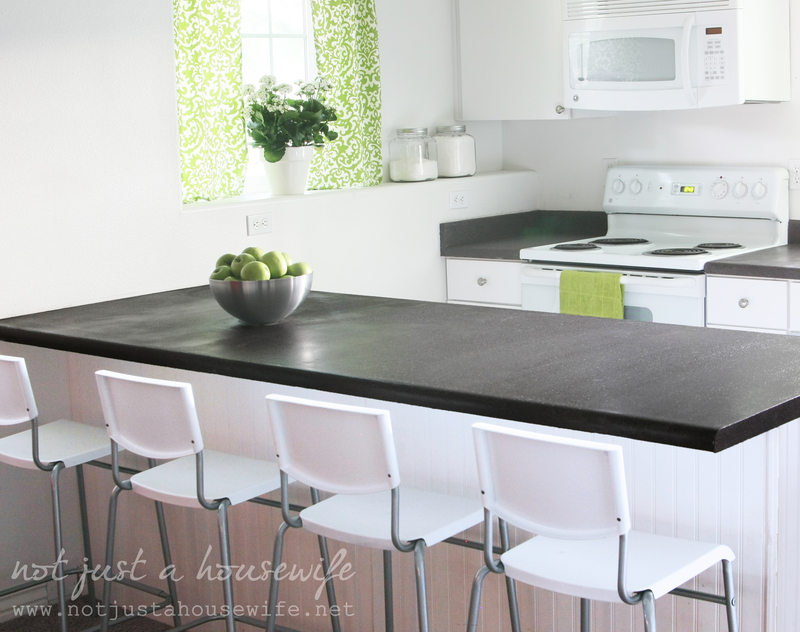 I cannot wait to see your countertop resurfacing! I have a some laminate that needs replaced! This is beautiful!!!! Wow, did she cry when she saw it? I would have burst into tears- tears of absolute joy for how beautiful it is! It is light, bright and joyful and must have just gladdened her heart. What a great thing to do. Much appreciated, I am sure! What a blessing, Stacy! My sister passed away in 2000 and I miss her every day! It thrills my heart to see other women embracing their sisters and being a rock for them in tough times. So sorry I didn’t get a chance to meet you at Haven, but I know you were a busy gal! Stacy, What a great transformation and it’s such a blessing to your sister, I’m sure. Sharing your gift with others like this is absolutely inspiring. We’ve all been there with plan B, and sometimes we just have to make beauty out of ashes. Blessings to you and prayers for your sis. Love this! Can you come do mine now? This is absolutely gorgeous. It’s light, elegant, fun, inspiring, and simple. But the part I love most is that you did something hard and meaningful for your sister. That’s love. You are such a great sister. I’m sure she loved the thought and care you put into it. Change is never easy, but having a pretty place to settle and let the changes happen is important. I’m so glad this came together for you and your sister. Looks fantastic!! Great job, what a great sister you are! 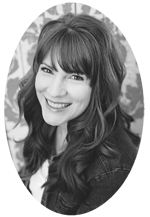 Hi Stacy, Awesome work and beautiful results! The fact that you did this for you sister made me cry and all I can think of was what a great love you show and that it really does come back to you!!! I wish I had my sister with me today to also share with her your great work! Pace yourself now that kids are in school! Everyone will be needing a piece of you! How special is that?I’m really proud of all you do! So, so sweet of you! And it came out absolutely amazingly! Love the green paint on the pendant! I’ve been looking for the meadow green color by Rustoleum and it looks darker than your color. 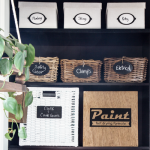 Can you post the type of Rustoleum spray paint you used – like American Accents or Painter’s Touch? 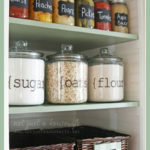 I would very much like to do this in my kitchen. Thanks! Goodbye to the old style kitchen. The new one has a simple fashion statement, neat and beautiful. You did a good job! To me this post is so much more than counter-tops and and curtains. A-it makes me grateful for the blessings i have, and b-it makes me wonder how much more can i do with my own life, and how else i can help someone elses. This is just beautiful. How are the bar stools holding up? I am considering getting a few from Ikea. They are so reasonably priced…I am wondering if it is too good to be true! What an amazing sister you are! 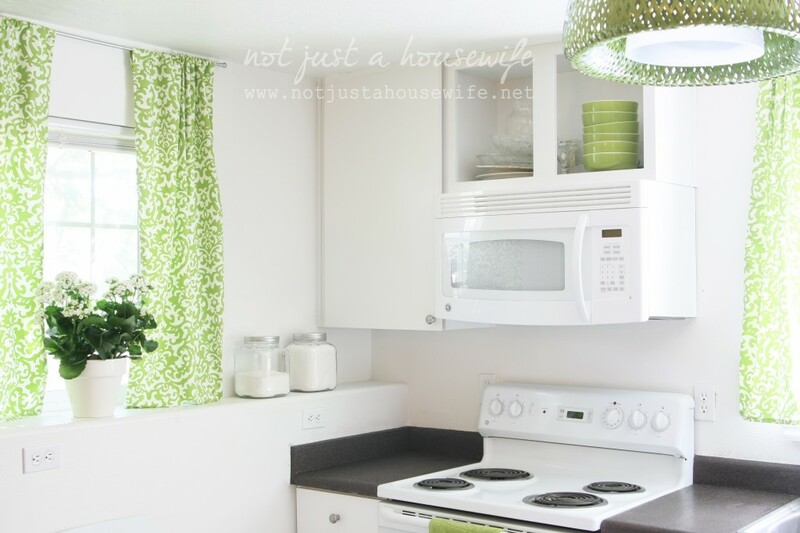 The kitchen is just lovely and I love that fresh green color! I wouldn’t worry too much about the paint on the plastic stool seats. Even if it starts to wear a bit, a little of the spray paint will freshen them right up. Your family is lucky to have you! Hugs to you all! I don’t know what your sister is going through, but this is so very nice of you and your husband to do this for her! It is now so bright and cheery. I know that she will feel the love whenever she enters her kitchen. I am curious how you much light the light fixture gave off. I am thinking of getting this for above my kitchen table but read that it is more of a soft glow from some reviews and I need a decent amount of light. Love the makeover. Thanks!! Did you ever do the follow up post you mentioned on doing the counters? I’m curious what color was used. high. I must remember that. Bless you both. Amazing in so many ways. What a beautiful gift you gave your sister. I bet it really lightened her burden a bit. Love the feeling of happiness you created. My mom lives in a tiny apartment where the itty-bitty kitchen is dark brown and muddy yellow. Oh, to be able to do something like this for her. I’m curious how her counter tops are holding up. What a wonderful job, it is so bright and cheery.. She is blessed with a sister like you. I’ve been trying to figure out how to get the IKEA Boja pendant lamp that length! Do you have a how to on that? Thank you!